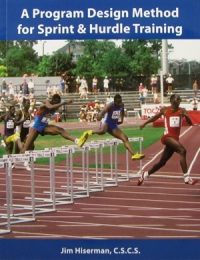 This article is guest blogged by Jim Hiserman, author of the books Program Design Method for Sprints & Hurdle Training and Strength and Power for Maximum Speed. Part 1 – A Total Sprint-Training Program for Maximum Strength & Power, Core Strength, and Maximum Sprint Speed. Speed is a skill that must be constantly rehearsed. The secret to training any motor skill lies in the training of the Central Nervous System (CNS). Successful training for speed development is mostly neural in nature. Although sprinting is a product of many training factors (see 1-9 above), neuromuscular training must be the primary focus where maximum speed development is concerned. Programming athletes to perfect the proper technical model of sprinting is where sprint training should begin. It must be emphasized that this training is neural and not metabolic. Therefore, proper training to perfect the technical model of sprinting has to be done at event speed, or close to it, with proper rest between drills so that the nervous system is not fatigued. 1. Develop strength and power. 2. Develop technical model of a skill or event. 3. Develop advanced levels of strength and power. 4. Develop advanced technical model of a skill or event. Intra-Muscular is work primarily concerned with specific sensory muscle components and the corresponding specific motor unit output. In programming the model of sprint technique it is not necessary to have a great strength and power base. It is therefore appropriate to train strength and power concurrently with neuromuscular coordination involved in proper sprint mechanics. In addition, it is “vital” that Core Strength Development be integrated into the entire plan so that the postural demands of pelvic and trunk stabilization necessary for efficient sprint mechanics can be mastered. The most important rule in teaching sprint mechanics is to make sure the basic technical model has been mastered before introducing the advanced technical model. In addition to perfecting the basic technical model of sprinting the athlete must also have developed advanced levels of strength and power before trying to master the advanced technical model. Without advanced levels of specific power, the athlete will not have the necessary tools to master the advanced sprint model. The vital element of this sprint-specific power development is ELASTIC POWER. READ Is Thirty Track's New Twenty? With the development of sprint-specific/elastic power and the mastering of the advanced sprint model, athletes can complete the equation for successful sprinting. POWER + COORDINATION = SPEED. The importance of perfecting the technical sprint model cannot be over emphasized. The perfecting of intra- and inter-muscular coordination that is necessary to produce a "motor program" takes hundreds of hours! Because of this it is important to emphasize extreme focus on each individual sprint drill. In addition to sprint drills, special attention must be placed on proper execution of sprints done at 95%-100% of maximum speed with rests long enough to allow for complete recovery of the CNS. 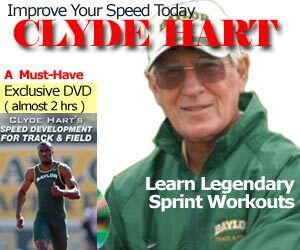 A successful sprint program provides for progressive development of athletes so that they are ultimately able to "unconsciously" execute proper sprint mechanics at maximum velocity. The constant utilization of task-specific cues by both coach and athlete is necessary for development of the "automatic competence" found at the top level of sprinting. Without constant focus on specific cues, it is possible for athletes to revert back to "unconscious incompetence." Various drills can be employed for an active-dynamic warm-up. The drills should take time to work all bio-motor abilities that will be utilized in the actual event. It must be extremely specific. Coaches must supervise the entire warm-up and make sure all drills are performed in a technically proficient manner. Constant feedback and use of task specific cues by both coach and athletes is extremely important. By using an active-dynamic warm-up made up of sprint-specific drills, coaches can take advantage of extra "programming" time. As stated earlier, it is extremely important to "focus" on all warm-up and sprint drills. Without proper focus on execution, there is little chance of proper motor program development. Use of task-specific cues can ensure that the focus is maintained. not include static stretching. Static stretches decrease the body's ability to increase elastic force. Putting muscles in a static/relaxed stretch de-sensitizes muscle spindles. The muscle spindles need to be excited prior to high velocity movements. What test is there to show the CNS gets fatigued? Is that something we are guessing on or is that something that is proven?